Whoever of you leads the people (in prayer), then lighten it, for indeed amongst them are the weak and the young and those with needs. (Bukhari & Muslim). Hence, the imam considers those being led in prayer and is gentle with them regarding the taraaweeh (in general) and during the last ten nights. This is because people are not all the same (in ability, strength and eeman), people differ, therefore it is a must for the imam to consider their situation, and to encourage them to come and to attend; when he lengthens (the prayer) it becomes difficult upon them and they become averse from attending. So, it is a must for him to consider that which will be a means of encouragement for them to attend, and make them desirous of attending the prayer, even if this is by shortening and not lengthening. 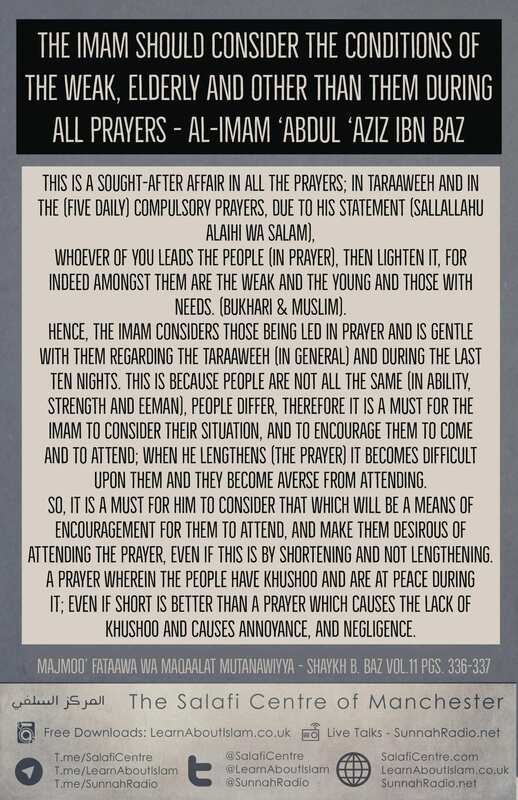 A prayer wherein the people have khushoo and are at peace during it; even if short is better than a prayer which causes the lack of khushoo and causes annoyance, and negligence.